Are we able to produce a castor with a 15,000 kg load capacity, to transport very heavy moulds for super yachts, with a low rolling resistance? After approval, a bespoke heavy duty fabricated Twin castor was manufactured using twin machined Cast nylon wheels. 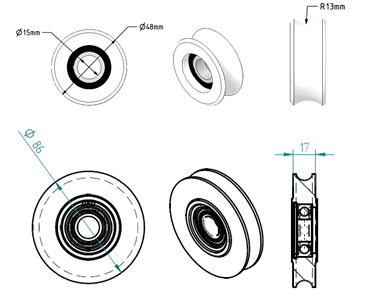 Each wheel was 400mm in diameter with 110mm tread width, and each wheel was machined with a radius on the tread which helped to achieve the required low rolling resistance as well as the high load capacity. We want a flexible automatic feeding System delivering fresh produce 24/7. The customer requires a wheel and castor which are able to withstand the conditions that farming brings. The first part of the solution was to fit two separate polyurethane 300mm diameter wheels with a low shore hardness for increased cushioning. Grooves were added to the wheel to provide extra grip and we were able to personalize this with the customer’s name. The second part was the complete castor which was fitted with a 250mm diameter wheel. The frame work we customised as the machine had very limited space, to optimize the motion we used a smaller fork radius, the wheels themselves were a soft polyurethane offering a very low rolling resistance and this has a glass fibre-reinforced core. We also specially proceed thread guards to protect the bearings. 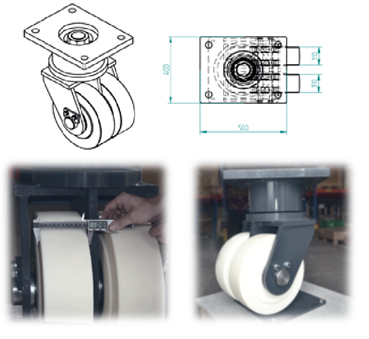 Are we able to produce rollers that give a longer lasting life span and can also be more cost effective compared to their traditional roller wheels? A machined nylon roller would be more expensive than injection moulded so would the extended lifespan outweigh the extra cost? BIL are able to machine Nylon or POM to almost any size and as a result we are able to manufacture any roller to any specification, including OEM products. We were able to save the customer 50% on the current Injection Nylon Rollers and also reduced there lift down time. Telephone number +44 (0) 01249 470 434 or 07741 312 865, email projects@bilgroup.co.uk or through our form free advice for wheels.